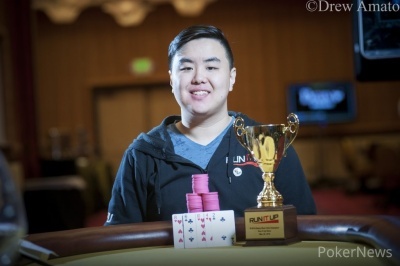 Michael Chan came out on top after a long heads-up battle with PokerNews contributor Brent Harrington in the $125 8-Game Stud Club Championship at Run It Up Reno. An emotional Chan took down $2,810 after his victory over a field of 87, which came after both players were nearly felted at various points in the heads-up match. 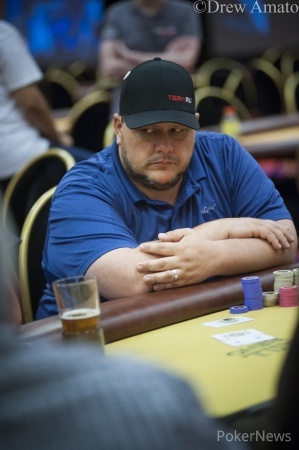 Tournament host Jason Somerville made a deep run, but he busted out just shy of the money, and after the bubble burst, World Series of Poker bracelet winner Leo Wolpert was the ninth-place finisher and the first to be paid. Chan held the lead as the final table began, but it was anyone's game since nobody even had 10 big bets for the limit games, with Chan having about eight. Chan solidified his position with a double knockout in no-limit hold'em. He called the shove of a short-stacked Andrew Phares, only to see Andy Camou shove behind for just a bit more. Chan didn't like it, but put both at risk. Chan had the , Phares had the , and Camou the . The board ran out and Chan took it with eights. Harrington won a huge pot in pot-limit Omaha to knock Dan Hernandez out and double through Greg Bitterly, and that gave him half of the chips in play. Bitterly busted in short order, and Harrington and Chan headed to heads-up play with nearly even stacks. In what would be a theme throughout, Chan grabbed the lead early in 2-7 triple draw, but Harrington battled back in some of the stud rounds despite being down to just a few bets. He retook command in a monster no-limit hold'em pot when Chan opened for 100,000 at 10,000/20,000/5,000 and called a shove of 355,000 with the . Harrington had the and doubled through when neither player improved. Chan was left with just 120,000, but came roaring back with aggressive play, particularly in the pot-limit Omaha round. 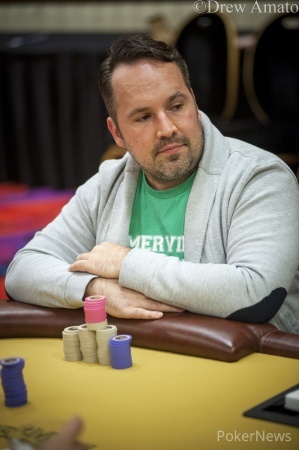 Then, Harrington made a crucial error in triple draw, likely attributable to the fact that the players were battling at nearly 5 a.m. by this time and had been up since before noon if they started in the $535 Main Event on time. Harrington mistakenly thought draws were over when he tried patting a hand he later said was two pair while Chan had drawn one. Harrington then tossed away two on the final draw, while Chan drew once more and raised when Harrington came out betting. Harrington was unable to reverse the damage this time, and Chan took the tournament in short order. Michael Chan raised to 100,000 on the button, and Brent Harrington called. Both drew two, and Harrington came out betting. Chan called. Harrington patted, and Chan drew one. Harrington bet again, and Chan called. "You probably win," Harrington said. The only problem was there was still a draw left. Harrington broke and threw two away, while Chan drew once again. Harrington fired a bet, and Chan raised. Harrington mucked immediately and was left with only 75,000. The next hand, they got it in with Harrington drawing one the whole way while Chan went three, two, and pat. Chan showed and Harrington couldn't beat it. Brent Harrington took the lead when Michael Chan raised to 100,000 on the button and Harrington jammed for 305,000 at blinds of 10,000/20,000. Chan snapped and was happy to show but Harrington had . The board ran out , and Harrington doubled. Chan has since battled back a bit but is still down. The levels went up and they're playing blinds of 15,000/30,000 in big-bet. Michael Chan limped then bet fourth and fifth. Harrington jammed for 39,000 more and Chan called. Harrington was in danger of drawing dead on the end but let Chan flip first and it was a brick, so the sevens were good. Limits have moved to 40,000/80,000. Brent Harrington completed with , and Michael Chan raised with . Harrington made it four bets, and the two got all but Harrington's last 7,000 in on fifth after Chan bet fourth. Chan had a made ten and picked up a dead on seventh. Harrington needed to improve but did so with a . Limits are up to 30,000/60,000. Michael Chan raised on the button and Brent Harrington called. Harrington drew three and Chan two, and Harrington check-called. Harrington drew one and Chan patted, and betting action was the same. Both players patted the last draw, and Harrington again check-called. Chan showed and it was good. Betting limits are now 24,000/48,000. We picked up action with Greg Bitterly all in for 49,000 and the first draw having already occurred. Michael Chan drew three, and Bitterly patted. On the last draw, Chan drew one and Bitterly patted again. "I have a jack," Bitterly said, throwing into the middle. Chan flipped over his draw: . "I beat you," he said, showing with it. There May Be Eight Games, But There Can Only Be One Stud!